This Detergent is from the Janitorial Direct own brand and comes in a 1 litre bottle making it ideal for use in workplaces and commercial properties such as hotels, cafes and restaurants. This washing up liquid is ideal for when having to manually wash up crockery and kitchen utensils; it not only removes grease and grime but also has a fresh lemon scent. It is available to buy online as part of a bulk buy option. A copper scourer reduces the risk of scratching the more delicate surfaces. Ideal for kitchen and bathroom areas. Can be used to remove rust. 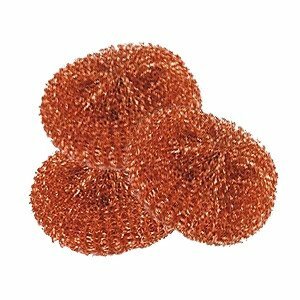 Q: Are these scourers pure copper or are they copper plated? A: These scourers are copper plated.